Rebecca Beatrice Brooks March 25, 2018 July 31, 2018 No Comments on Where Did the Industrial Revolution Take Place? The industrial revolution began in Britain and then slowly spread across the world over the span of a few centuries. The first regions of the world to be industrialized were Western Europe, then North America, followed by Eastern Europe and Asia. In addition, some countries never fully industrialized at all, such as numerous countries in Africa and Asia while others, such as Russia, are only partially industrialized. The industrial revolution began in Great Britain in the late 1770s before spreading to the rest of Europe. The first European countries to be industrialized after England were Belgium, France and the German states. The rest of Europe didn’t industrialize until after 1850. Spain, Portugal, Austria-Hungary, Italy and the Ottoman Empire started to industrialize very late in the 19th century. Belgium was the second country in Europe in which the industrial revolution took place and the first nation in continental Europe. Belgium became the world’s second industrial power, after Britain. In France, industrialization was slower, due to its lack of coal and iron. By the end of the 19th century, the majority of French workers were still employed in non-manufacturing jobs. When France did fully industrialize, textile and furniture manufacturing became the dominant industries. In Germany, industrialization was also slow, due to the region being divided into several independent states rather than a unified country, but Germany eventually became a global leader in chemical research in industrial and university labs. Germany now has the fourth largest economy in the world, while Great Britain’s economy is fifth, France is seventh and Italy is ninth. The industrial revolution in America began after two textile manufacturers, Samuel Slater and Francis Cabot Lowell, introduced mechanized textile manufacturing to the United States in the late 1790s and early 1800s. The factory techniques used in their textile mills, particularly Lowell’s factory system, were then applied to other types of manufacturing in the United States, which further spurred industrialization in the country. During the first industrial revolution, which occurred from between 1750 and 1850, industrialization was more prevalent in the northern states while the south remained primarily agrarian. 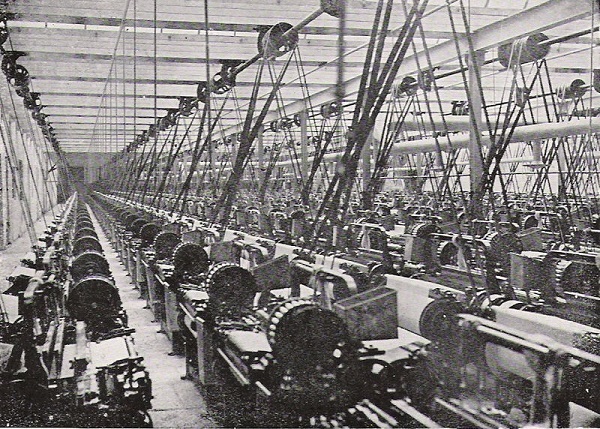 America’s textile manufacturing, which started out as primarily a northern industry, eventually migrated completely to the south by the early 20th century due to technological advancements that made mills less reliant on water power as well as other factors like cheaper energy costs in the south and close proximity to textile crops. Although the first industrial revolution began in Great Britain and then spread to the United States, the second industrial revolution, which saw the rise in electricity, petroleum and steel, actually began in the United States and then spread to Europe and the rest of the world. 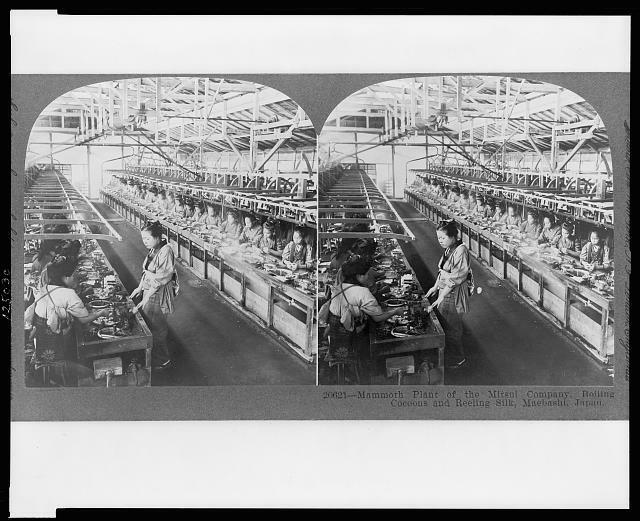 By the 1890s, the United States surpassed Britain for first place in manufacturing output and by the beginning of the 20th century, per capita incomes in the United States were double that of Germany and France, and 50 percent higher than Britain. The United States is now the largest economy in the world. The industrial revolution came late to India, due to its complicated political and economic relationship with Great Britain. Although India, which was a British colony, dominated the global cotton textile markets in the 18th century, the Indian textile industry took a hit when the industrial revolution began in Great Britain. The use of steam power in British mills reduced the cost of British cotton by 85 percent, making its textile goods internationally competitive for the first time. Britain quickly became a leading world exporter of textiles, displacing India in the process. In addition, in order to protect its new textile industry, Great Britain began to restrict textile imports from India and other countries by establishing tariffs and other protective policies. Great Britain instead began to export its own textiles to India. This halted any plans Great Britain may have had to develop India’s textile industry and instead led to India’s deindustrialization, with British lawmakers pushing the country to become more agrarian than industrial. New colonial laws forced Indian farmers to devote most of their fields to cotton crops, instead of food, which led to widespread famine and poverty in India. Therefore, the industrial revolution reversed India’s economic relationship with Great Britain so that it was now merely a supplier of raw materials for Great Britain and an importer of British textiles, instead of a producer of textile goods. As a result, it took decades before India started adopting modern industrial practices, such as steam power and mechanized spinning and weaving, in its textile manufacturing. 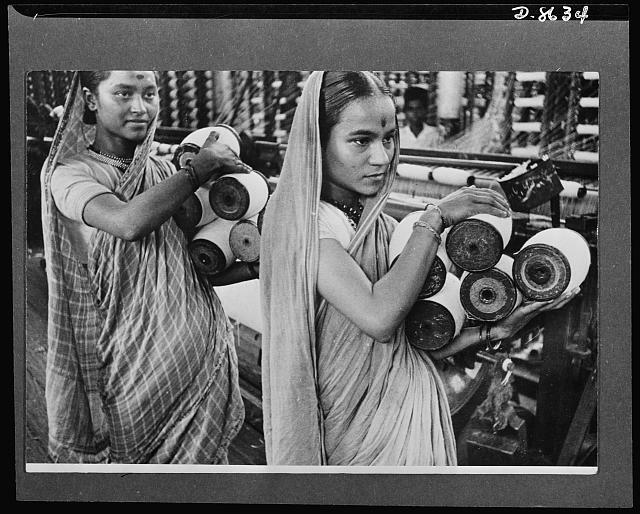 Women workers in a booming Bombay textile mill, circa 1941-1943. Photo by United States Office of War Information. The industrial revolution finally came to India in 1854, when the first steam-powered cotton mill in Asia opened in Bombay. Growth was slow though and the expansion of these modernized cotton mills didn’t pick up until the 1870s and 80s. India now has the sixth largest economy in the world. Large-scale industrialization of Japan began around 1870 after a political revolution brought into power an oligarchy that ruled through the name of a teenaged emporer named Meiji. This new leadership opened Japan’s borders to foreign trade, which brought an end to a 250-year policy of national isolationism enforced by the former feudal Japanese military government, Tokugawa Shogunate. These Meiji-era political leaders felt that industrialization and a modernized military were vital in preventing the colonization and exploitation of Japan by western countries. The new government launched a massive industrialization program, bringing in scholars and scientists from Europe and the United States to help transform the economy. Japan adopted steam power, began constructing steel works and built a national railroad system. In addition, Japan’s silk manufacturing process was mechanized when it moved from family farms to factories. Japan then exported its silk abroad in exchange for foreign goods like modern weapons. Japan’s GDP (gross domestic product) remained relatively stable throughout the 19th and early 20th century, but far below Western countries like Britain, France, Germany and the United States, although it began to improve after WWII and is now the third largest economy in the world. The industrial revolution reached the Russian Empire much later than most other European and Western countries. The emancipation reform of 1861 helped transform Russia from a predominantly agrarian society to a more industrialized society. After the reform, the newly emancipated serfs, which were peasants that originally worked for the feudal government, began migrating to the cities in search of jobs. Between 1860 and 1890, coal production grew by 1,200 percent to over 6.6 million tons per year, and iron and steel production more than doubled to 2 million tons per year. In the 1880s, Russia began to establish large scale factories that produced steel and textiles. In 1891, Russia began construction on the Trans-Siberian Railway, which eventually became the longest railway line in the world. Around the end of the 19th century and beginning of the 20th century, the Russian government began to pass new tariffs in order to protect Russia’s industries and the Russian banking system was reformed to keep up with the new industrial and economic system, such as with the establishment of the Russo-Chinese bank which was created to help finance a railroad across northern Manchuria in order to shorten the Trans-Siberian Railroad. Russia now has the 12th largest economy in the world. The industrial revolution didn’t occur in China until the 20th century. Industrialization in China occurred in three phases. The first phase, known as the Great Leap Industrialization period, occurred between 1958-1961, during which China diverted money away from the agricultural industry and invested it in industrialization projects instead. During this phase, Chairman Mao insisted his citizens stop growing crops and instead build small stell furnaces for melting steel in an effort to compete with Britain’s steel production. The plan was a complete failure as the steel was low quality and around 30 million people died from starvation due to the lack of crops. Also, in 1958, in order to reduce overcrowding in cities, China began restricting the number of people allowed to come into the cities from rural areas. During this process, around a million high school graduates were sent to rural areas and many urban factories and workers were moved to rural areas. 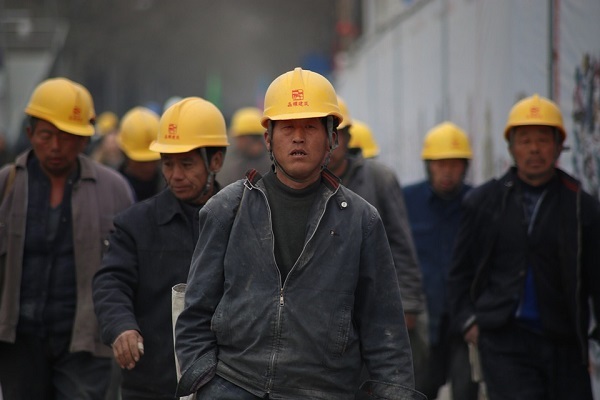 In the third phase, which occurred between 1978 to today, China began to drastically industrialize by building millions of small-scale factories throughout the country. As a result, between 1978 and 2007, China’s gross domestic product growth nearly tripled from 3.7% annually to 9.8% annually. China’s economy became so large that it overtook Russia’s economy in 1992, then overtook Canada’s economy in 1993, then Italy’s economy in 2000 and then the United Kingdom’s economy in 2006. China is now the second largest economy in the world. Africa has never fully industrialized mostly due to its history of colonization by European powers. The industrial revolution in Europe and imperialist countries during the 19th century led to what is known as the “scramble for Africa” which was widespread occupation and colonization of the continent. Colonization was important during the industrial revolution because industrialization created a huge need for raw materials, such as rubber, metals and timber, which a colony could produce, and at the same time, a colony often served as a captive market to import goods to. European manufacturers feared that a lack of new markets would result in overproduction, which in turn would lead to economic depression. This concern therefore spurred the urgency for colonization. As a result, colonization of Africa began to rapidly increase around 1884 after the Berlin Conference, during which diplomats decided how to divide Africa among European imperialists like Britain, France, Belgium, Spain, Portugal and Germany. Although only 10 percent of Africa was under European control in 1870, by 1914 it had increased to nearly 90 percent of the continent. As a result of this colonization and exploitation, Africa wasn’t industrialized and continued as a primarily agrarian society, with African farmers being forced to grow cash crops such as cocoa, coffee, sugar, peanuts, cotton, rubber, tea, palm oil, timber and tobacco, instead of food, leading to widespread hunger and malnutrition in Africa. When decolonization of Africa began in the 1950s and 60s, there were no established leaders within Africa to push for industrialization or economic reform. Furthermore, the economy in Africa collapsed as the value of its cash crops fell. There are a variety of reasons why Africa has so many countries that have yet to fully industrialize. Some of these reasons are: continued foreign exploitation of Africa’s natural resources, widespread poverty, widespread corruption in many African governments, a lack of tariffs protecting African industries and a lack of infrastructure. As a result, Africa remains the most underdeveloped continent in the world. Which Countries Failed to Industrialize? A number of countries on the continent of Africa and Asia have yet to industrialize as well as various island countries in the Pacific Rim and at least one island country in the Caribbean. 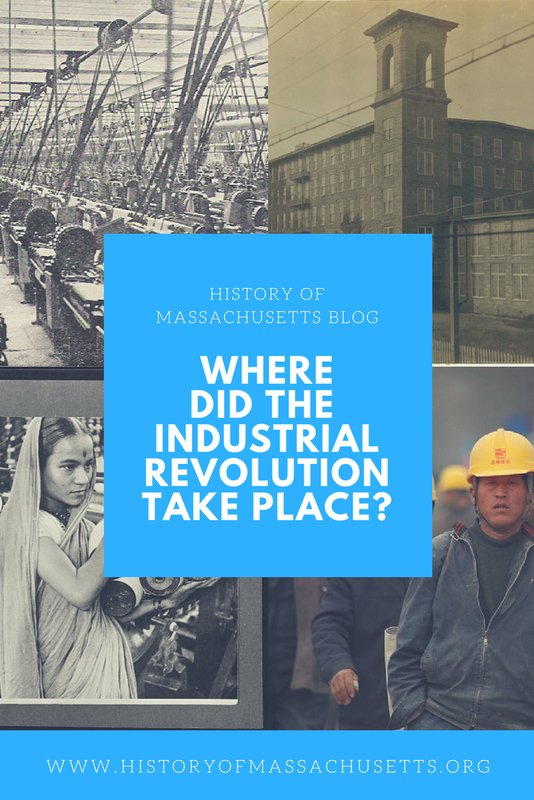 For more information about the industrial revolution, check out the following articles about the best books about the industrial revolution and the timeline of the industrial revolution. Rupert, Mark. Producing Hegemony: The Politics of Mass Production and American Global Power. Cambridge University Press, 1995. Majumdar, Sumit K. India’s Late, Late Industrial Revolution: Democratizing Entrepreneurship. Cambridge University Press, 2012. Henderson, W.O. Industrial Revolution on the Continent: Germany, France, Russia 1800-1914. Routledge, 2006. Clark, Victor S. The History of Manufacturers in the United States 1607-1860. Carnegie Institute of Washington, 1916. Crafts, N.F.R. “Industrial Revolution in England and France: Some thoughts on the question, ‘Why was England first?’” The Economic History Review, New Series, Vol. 30, No. 3, Aug. 1977, pp. 429-441.